Forty years have not dulled the ongoing love affair between "Star Wars" and Japan. Legendary Japanese filmmaker Akira Kurosawa’s influence on creator George Lucas and his original 1977 "Star Wars" movie is well-documented. However, as the multimedia franchise turns 40 this year, the interplay between it and Japan is being strengthened in ways that go well beyond Kurosawa’s influential 1958 film "The Hidden Fortress." 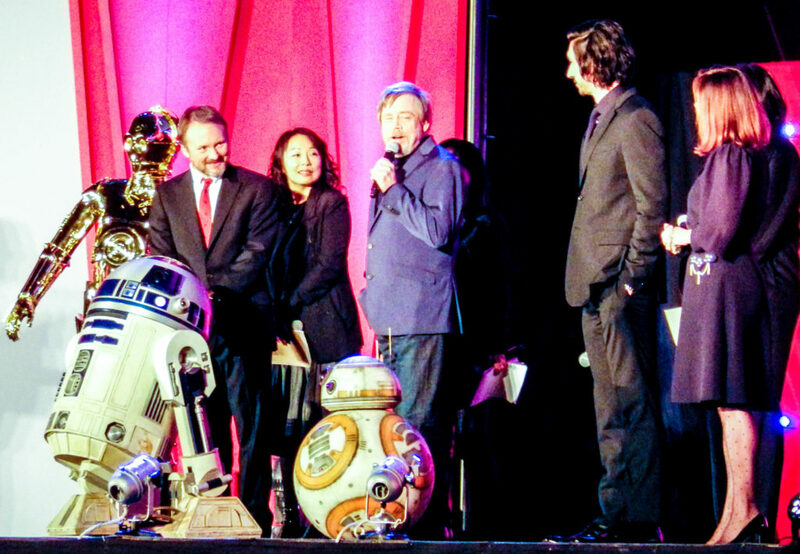 Though Lucas himself has retired and handed over the reins of the Lucasfilm company to Disney, "The Last Jedi" director Rian Johnson, veteran actor Mark Hamill and emerging stars Daisy Ridley and Adam Driver each have ties to Japan and its culture. On Dec 5, 2017, actor Mark Hamill was greeted with a hero’s welcome at Narita Airport as he arrived in Japan to promote "The Last Jedi," the eighth episode in the Skywalker saga and ninth "Star Wars" film overall. The original "Star Wars," now commonly referred to as "A New Hope" to distinguish it from its sequels and prequels, first hit theaters on May 25, 1977. Me personally I think Force Awakens was the better movie but I did like the fact that the Last Jedi was a much more original story than Force Awakens. The worse part of the Last Jedi, in my opinion, was when Princess Leia pulled a Mary Poppins trick. Agree with the audience reviews at Rotten Tomatoes: 54%. Actually, I think it's been proven that a lot of those bad reviews are "anti-SJW" trolls who don't like the diversification/feminization of Star Wars. I mean 54% is way too low... Even Phantom Menace has a 59%. Personally, I thought Last Jedi was better than Force Awakens, and still way better than the prequel trilogy films. It took more risks than Force Awakens while still remaining true to Star Wars. I found myself looking at my watch a few times during the latter half of the movie--not a good sign. The dialog was not great; the story was not engaging. Special effects were good, though. Agree with the audience reviews at Rotten Tomatoes: 54%. It's obvious the "professional" critics on that site have mostly become paid toadies for the Hollywood studios. Wasn't impressed by the movie, did not have the feel of a Star Wars more like a Guardian of the Galaxy. Too many plots and too many plot holes... Poor decisions made by all characters, hard to relate or care about them. I guess they are trying hard and succeeding in killing the "old" saga. Spoiler alert...The movie is not that good. RealCDN: You're being kind in your assessment (imagine me saying that with the tone of a Sith lord). The movie has been Disney-fied beyond any "last hope". Too, too, too many characters for me to care about any particular one. Rogue One did it the right way - focus on only one or two main characters. May the force take this franchise to the back of the barn and put its out of its misery. Saw 'The Last Jedi' yesterday. It was 'okay'. It could have easily been better - not sure why it was allowed to only be as good as it was. Just to Clarify that's "truest direction after Return of the Jedi"
The books will always be the truest direction after Jedi for me. Wedge leading Rogue squadron in the attack on Coruscant, Lando investigating the Dreadnoughts, Luke's Yavin 4 Jedi academy, Grand Admiral Thrawn and his Nogri assassin bodyguards. Those are awesome storylines, deep, give the characters the respect, power and trials they deserve, especially Mara Jade's conflict when she battles Luke. I don't care about anything other than these books, because for me, they are the true history of the Star Wars Universe.